For its developer, I believe the Clara Barton's middle name must be 'serendipity.' Located at 616 E St NW, the Clara Barton was originally built to serve as the Jefferson at Penn Quarter apartment building. It was instead sold as condos beginning in late 2004 [see the profile here] just as the District's condo boom approached its peak. It's a huge building, one of the largest completed in the past four years. According to the District's real property assessment database the Clara Barton has 255 units, although the District's real property sales database has recorded sales for only 253 units. 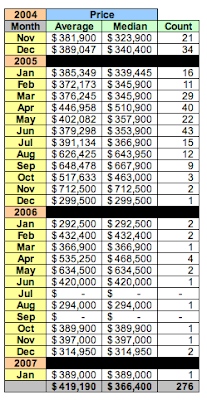 The District recorded 276 sales transactions (including 23 flips/resales) through the end of January 2007. Since its opening, 23 units have been flipped or resold. Update: Modified the table to show resale date and price per square foot. 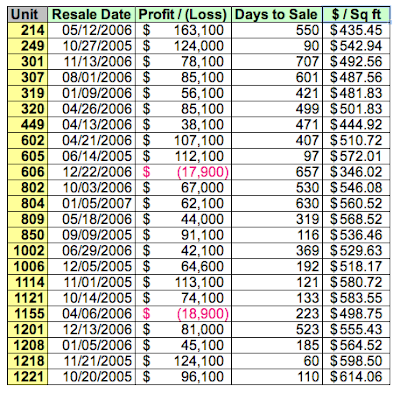 Average resale price per square foot was $524.82. DC6297330: unit #215, a 1/1 for $499,000. Selling at that price would render a $139,100 profit before transaction costs. DC6290182: unit #609, a 1/1 for $389,000. Selling at that price would be a $111,100 profit before transaction costs. DC6235161: unit #1009, a 1/1 for $409,900, after a $15,000 price reduction. Selling at that price would represent a $10,000 loss before transaction costs.